“I visited the Coach and Bus Show at the NEC, Birmingham on Wednesday, and found this amongst the new vehicles. 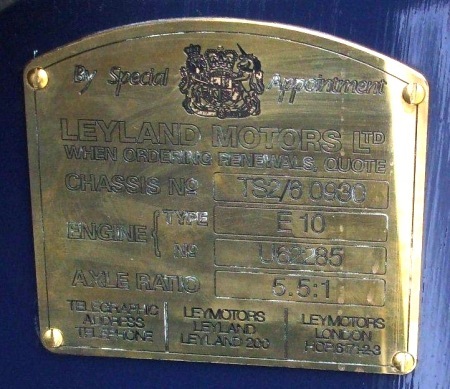 Bob also sent a shot of the interior and the Leyland Motors Ltd manufactories plate that is mounted on the bulkhead they are below. Fortunately under the Fleet Lists section of the site there is Keith Eastons very detailed East Yorkshire Motor Services 1926/1941 fleet list which is where I got the information from. 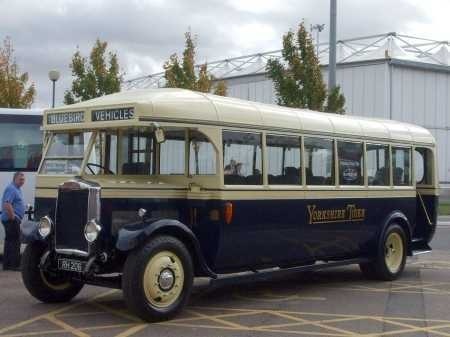 Keith also states that East Yorkshire disposed of 158 in January 1946 to Adamson Bros in Hull it would be interesting to know its history from then. As David rightly says, stunning indeed – perhaps someone could arrange a visit for a certain leading manufacturer in Northern Ireland to show them what a relaxing and dignified interior looks like eh ?? I can only echo Chris and David’s comments. I sometimes wonder what the essential design elements are about half cab single decker buses and coaches that in almost every case produce such elegant vehicles. The basic layout is fairly much identical yet the details are fascinating and how much more interesting they look than today’s standardised vehicles. It would be interesting to see what a modern designer would do to create a 2012 "half cab"..I know it would never pass current operating regulations but it could bring up some forgotten details that might guide the current box designers toward making better looking vehicles. Also, as Chris says, that Ransomes interior is both practical, peaceful and stylish with Art Deco themes..a vast improvement on the multicolour gaudy finishes now offered. Well done to the people who restored this bus and hopefully it will be out on the Rally scene next year! Richard, a modern designer would come up with a sub standard half cab. but they are (very) pale imitations of their classic forebears. Thank you John for that link. I’m sure I can speak for many when I say that this superb restoration leaves us aghast with admiration for such thorough and painstaking work, and for the incredible finished product. It’s always wonderful to see a lovingly restored vehicle and this is of the highest order. And nice to see a Ransomes’ body, too, for they retired from bus/coach body building not too long after this example. Their efforts always seemed to be of a good quality. I’ve no idea when Clayton Dewandre heaters came upon the scene, but this would appear to be an early fitment, I’d hazard. What a beautiful bus. All credit to the restorers. Looking forwards to seeing it on the rally scene. According to PSVC Fleet History PB17, the Tiger was next recorded as a caravan at Wilfholme Landing, (situated on the River Hull, between Beverley & Driffield) by 1953, and still there by 1980. It was purchased by Carl Ireland (I believe) at an unknown date and he did £15,000 worth of restoration, and then resold it to Bluebird. Bluebird’s website shows it as a bungalow, and on the low-loader in the state which it was purchased from Carl Ireland by Bluebird. Congratulations all round, I think. One small grouse though, I do wish it had carried East Yorkshire instead of Yorkshire Tiger! There were two of the three Ransomes bodied coaches in use as caravan homes on Mr R Harrison’s farm down Wilfholme Lane not far from Aike, (yak-a-baca-arram – in east yorks speak) 1st turn after Watton. There is a confluence of river and drain at the site it was very damp the day I went Feb 1983. so its just as well the bodies were covered in to some extent. My note that day says EY 156/158. I think Mr Harrison said they went there from EYMS via a dealer. Does anyone know the present whereabouts or status of this vehicle, please? "The assets of Bluebird Vehicles have been bought by Manchester based Woodall Nicholson". Now if I remember correctly in my days there they were a Halifax company that built hearses, John Stringer is the man who will correct me if I am wrong. William Nicholson (born 1822) was a Master Coachbuilder based in Scarborough during the 19th Century. He retired during the 1880’s after which he and his wife ran a boarding house in Castle Road. One of his sons – Thomas Woodall Nicholson (born 1848) moved to Halifax during the 1860’s to be apprenticed to a local coachbuilder there – probably that of George Piercy of Carlton Street. George Piercy (born 1805 in Harrogate) was the son of Thomas Piercy (born 1779) who had established a coachbuilding business in Halifax in about 1820, building horsedrawn cabs and carriages. In 1873 Thomas Woodall Nicholson bought out Piercey’s business and changed its name to his own. He died in 1914 and the business was taken over by his son Charles Woodall Nicholson. Under new management from 1933 the company, whose works were situated in Well Lane at the bottom end of the town, began to specialise in building hearses mostly on Rolls Royce chassis in the early days, though later on other types – particularly the Austin Princess 4-litre. They also rebuilt or refurbished a considerable number of prewar single deckers – particularly for United Automobile. In 1983 the company passed to the Hawley Group, which two years previously had bought Woodall Nicholson’s main rival in the hearse business – Coleman Milne of Westhoughton. The Halifax works was closed in 1987 and all manufacture moved to the Coleman Milne works. Coleman Milne was owned by the Henley Group, which in turn passed to the Hawley Group in 1985. Hawley sold Henley and Coleman Milne to Plaxton’s in 1989, but Coleman Milne was sold to a management buyout team in 1992, Woodall Nicholson becoming the holding company for Coleman Milne, Mellor Coachcraft and Mellor Vancraft. Recently the company has passed to a private investment syndicate. After Bluebird Vehicles went into receivership RH 206 passed (according to PSVC) to Miller, Scarborough. Thanks, John for the updated information on ownership, where does Barry Dodd (the Lord Lieutenant of NY) reside? Any idea of dates? According to my records 156 and 158 passed to a Mr Arthur Dixon of Washington Street, Beverley Road, Hull in 1948 for use as caravans. They were purchased by the EY Tiger Group in February 1982 (not sure who they were). 156 was broken up by August 1987. 158 then passed to a Mike Kilvington in August 1987 – he was based in Rugby but I believe he originated from the Hull area. His intention was to have it restored by apprentices at one of the colleges in Hull and I believe he was responsible for the work carried out. 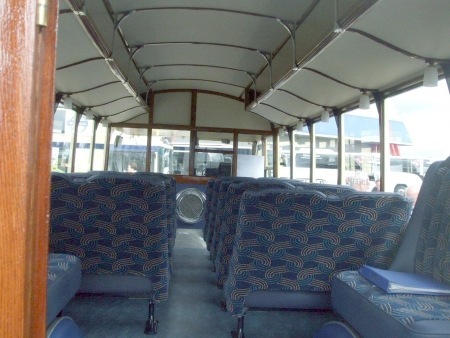 It then passed to Carl Ireland – it was then advertised in Bus and Coach Preservation Magazine in August 2001 for £8000 before passing to Bluebird. Bluebird also had at least one other vehicle their apprentices were to work on – I think this was a Southdown TD.